Sitting out on my balcony overlooking the Pacific Ocean, I heard seals barking nearby. 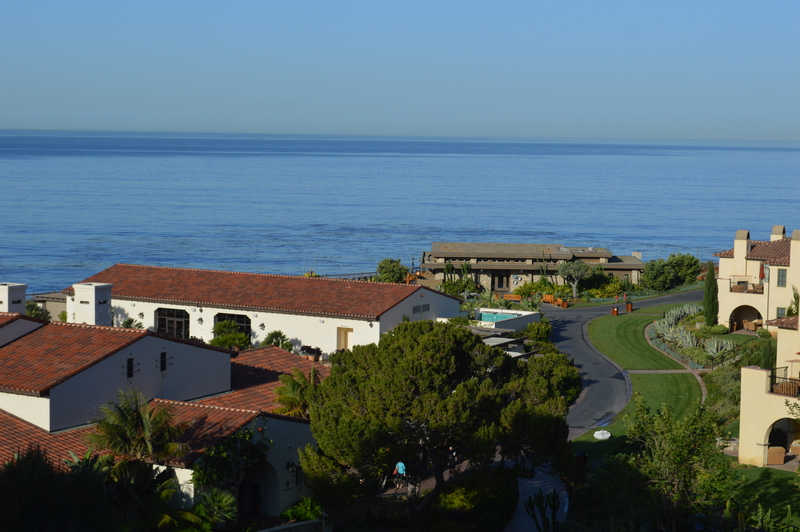 Along the cliffs of Palos Verdes a bevy of marine wildlife reside in the bucolic setting. Before dinner, I took a stroll and saw about twenty sea lions basking in the sun on rocks near the shore line. Continuing my stroll I was startled to see the spray of water coming from the blowholes of two humpback whales swimming near land. It was quite a magnificent sight to see these enormous mammals so close to the Terranea Resort in Palos Verdes. A staff member told me that there was a deep channel running next to the resort. Mother whales like to swim with their babies close to land to protect them from sharks and other predators. After my close encounter, I went back to my spacious room for a quick soak in the bathtub before getting ready for Terranea’s Chef’s Table Dinner. Overlooking the Pacific Ocean at sunset while sipping a Justin Sauvignon Blanc wine and nibbling on truffle tater tots sprinkled with foie gras at the elegant Terranea Resort is an excellent way to start the summer. During Terranea’s fifth anniversary, Executive Chef Bernard Ibarra cooks with other chefs at the resort to offer guests an elegant culinary evening and help local charities in Southern California. I dined with 12 other guests on the patio of one of Terranea’s luxurious villas next to the golf course. Sitting on white chairs at a communal table on the bluff on the Palos Verdes Peninsula was an intimate and interactive dining experience. The theme, Spring’s Bounty, began with a cocktail or glass of Justin wine from the Paso Robles region to pair with hors d’oeuvres. Chef David Tarrin prepared Japanese confit of chicken Yakitori; pepper-crusted toro Nicoise with olive tapenade and a crisp sunchoke. My favorites were the deviled baby quail eggs. In addition to the exquisite truffle tater tots, there were plates of lumpia of Kobe beef and langoustine with a sweet chili garlic sauce. My cool glass of Justin Sauvignon Blanc offered an essence of apple and lemon pie. Executive Chef Bernard Ibarra prepared the first course of smoked spring lamb tartlet and a small glass of first-crop snap-pea chilled soup. “When I think of a protein for Spring, I think of lamb,” Bernard said. It was served as a Napoleon with smoked lamb layered with a crispy pastry dough, similar to a Greek phylo, yet more dense. He layered fennel grown on the property, house-crafted goat cheese and an exotic carrot top chimchurri. It was exquisite in presentation and flavor profile. There was also a demitasse cup of pureed snap peas just picked in the morning with apple mint and lavender. On top was a beautifully designed house-made cumin yogurt lassi. The snap peas were blanched and blended, offering an earthy flavor profile. The herbs were harvested from the garden behind Terranea’s fine dining restaurant mar’sel. Chef Bernard likes to make his own sea salt to sprinkle on his dishes. He also is known to pick the pink peppercorn berries from the trees around the property and grind them to dash onto his creations. This dish was paired with a glass of oaky Justin Chardonnay. 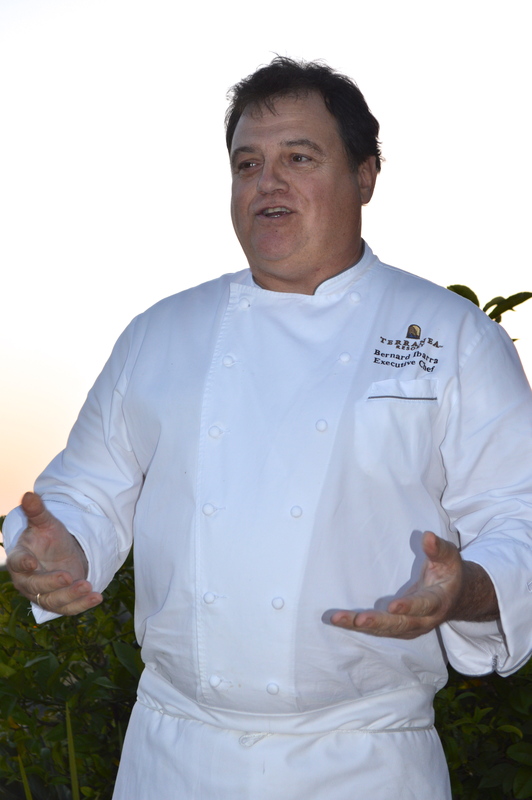 Before arriving at Terranea, Chef Ibarra was a talented chef working in Las Vegas. After a while the bright lights, glitzy guests and desert air got to him, and he packed his bags and headed to the Pacific Ocean to be the new Executive Chef at the picturesque Terranea Resort. He enjoys bringing garden-to-table produce into his dishes by planting seeds and watching vegetables and herbs grow before he harvests them for his signature dishes. He uses land on the Terranea property and plots at Jim York’s Catalina Garden. “I get very happy when I harvest vegetables,” said Bernard. 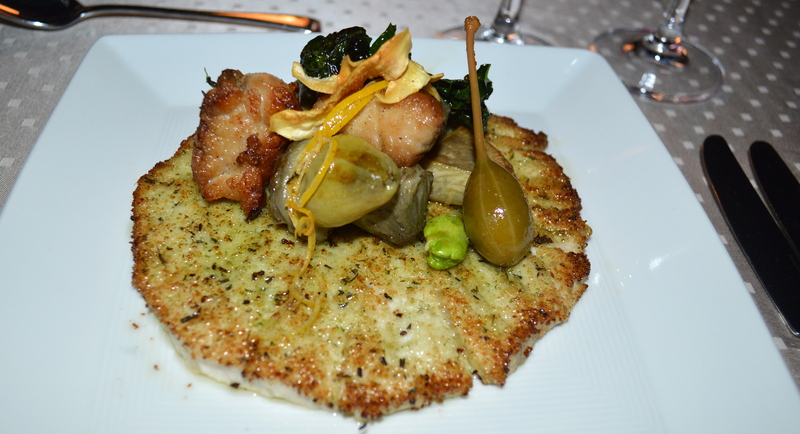 This dish was followed by swordfish paillard prepared by Terranea chef Andrew Vaughan. With the ocean coming back with many species of fish during spring and summer, swordfish is coming up from Baja. “Swordfish is a beautiful fish that is full of life,” said Bernard. Chef Vaughn made a swordfish paillard and veal sweet breads that looked like a frittata with roasted artichoke hearts and baby artichokes, favas, kale and a lemon caper brown butter drizzle. It was paired with a glass of Justin Justification. We finished the meal with a sweeter Justin Obtuse paired with Executive Pastry Chef Pierino Jermonti’s dazzling Meyer lemon panna cotta with candied pineapple and sea salt roasted pistachios. While passing around plates of handmade chocolates we learned that Terranea employees gave $37,000 to the Leukemia & Lymphoma Society to help them fight blood cancers. What a sweet ending to a decadent dinner. Tickets for this special multi-course dinner paired with wines are $225 per person and must be purchased in advance. Guests who purchase two tickets will receive a complimentary ocean view room for the night of the event. Guests must be 21+ years to attend. Upcoming Chef’s Table Dinner Series include Thursday, August 13 with a Honey Bee theme. Summerland Winery will enlighten guests with their wines and pours with each course. Proceeds from this dinner will benefit the American Red Cross. On October 29th the wine harvest theme offer dishes from the wine regions paired with Catalina View wines. This dinner’s proceeds will go to Meals On Wheels. The last dinner of 2015 is on Thursday, December 3, offering winter harvest traditions. Margerum Wines from Santa Barbara will pour some of their signature favorites. Proceeds will be benefit City of Hope. To learn more, go to www.terrenea.com. 100 Terranea Way, (310)265-28oo.